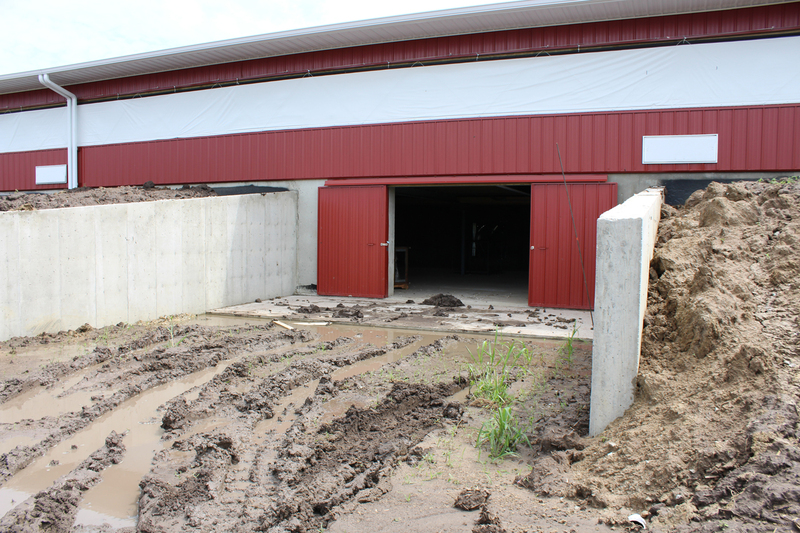 A deep pit has less moving parts than a scraper system and the 12 months of storage allows for the application of all manure after the crops are out. 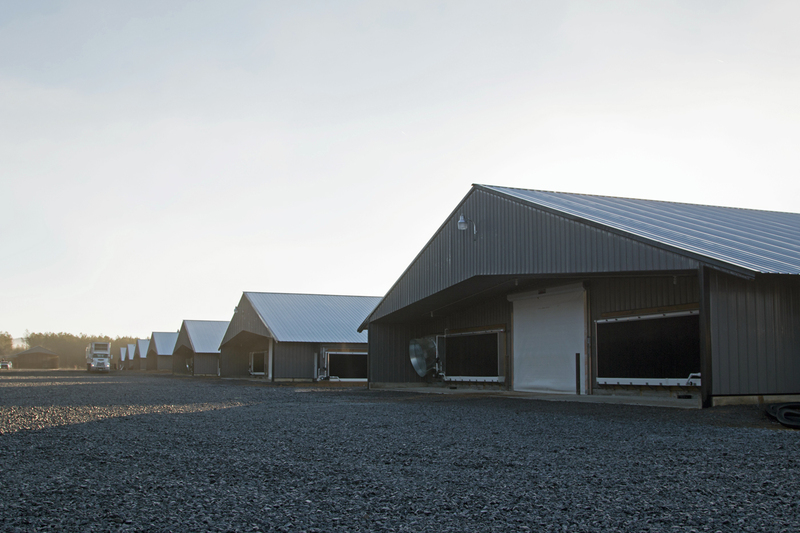 When Larry Nightingale constructed a 50' x 500' building to produce cage-free eggs on his 700-acre farm in Pulaski, IA, utilizing the manure from the 20,000 laying hens was an important consideration. "A deep pit has less moving parts than a scraper system and having 12 months of storage allows us to apply all the manure in the fall after the crops are out," explained Larry. 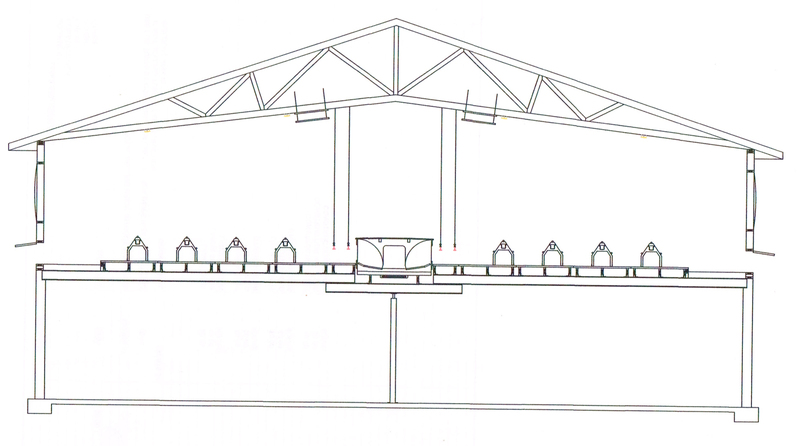 The eight-foot-deep pit under the building consists of a steel reinforced concrete floor with eight-inch formed perimeter walls. Two openings, with slider doors, permit access on each side to remove the litter from the pit with a skid loader. The nests and flooring are suspended above the pit with a support system constructed from 8-inch "I" beams spaced on ten-foot centers. The "I" beam framework sets in pockets in the pit walls and is supported in the center by steel posts. A double row of single-tier colony nests runs down the middle of the building. 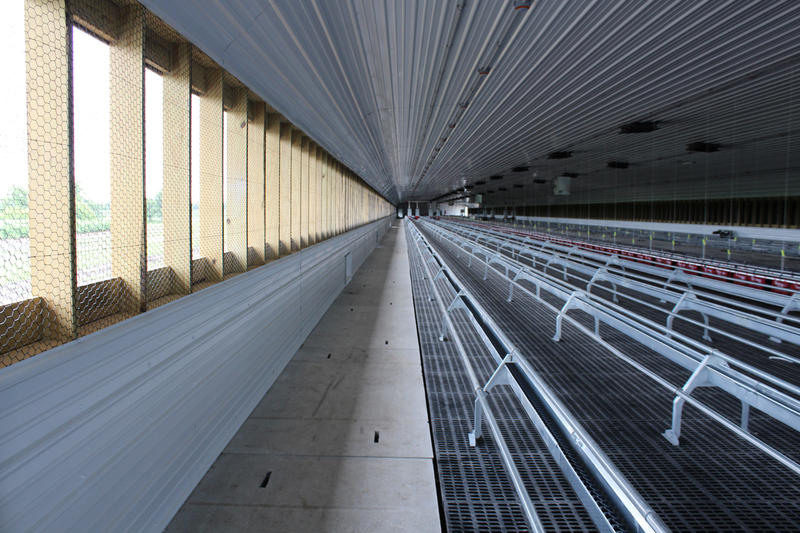 Curtain fronts on the nest provide the hens with a secure, dark laying area with AstroTurf® covered floors sloping to the center collection belt. 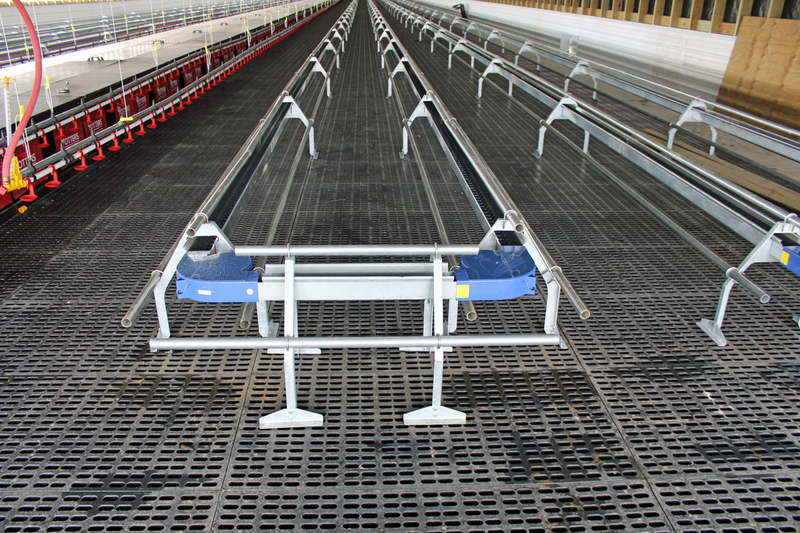 The nest floors rise to exclude the birds from the nest during the night. 18’ of raised plastic slatted flooring extends on each side of the nest boxes with the chain feeding and water lines located there. Unique triangle supports used on the chain feeding trough provide additional roosts for the hens. One noteworthy design feature is the pre-cast concrete used for the scratch areas located along the outside walls. 4' x 10' solid concrete slabs were placed on the support beams roughly four inches lower than the plastic slats. Manually operated access doors located above the scratch area permit the birds to access outside pasture runs. The natural/ power assist ventilation system provides the birds with a comfortable year-round environment. Three 52" pit fans cycle on timers during the winter drawing air through ceiling inlets. As the temperature increases, the sidewall curtains start to drop to allow natural airflow to cool the interior. At approximately 80 degrees the system switches to tunnel ventilation with the sidewall curtains closing and end tunnel curtains opening as the ten 54" end wall fans stage on. Although deep pit structure may have a higher initial cost, there are several advantages for integrated farming operations. 12 months of storage allows fall application for maximum crop utilization. As Larry pointed out, a deep pit is virtually maintenance free with no moving parts compared to using a scraper or belt system to remove the manure from under the slatted area to a separate storage pit.